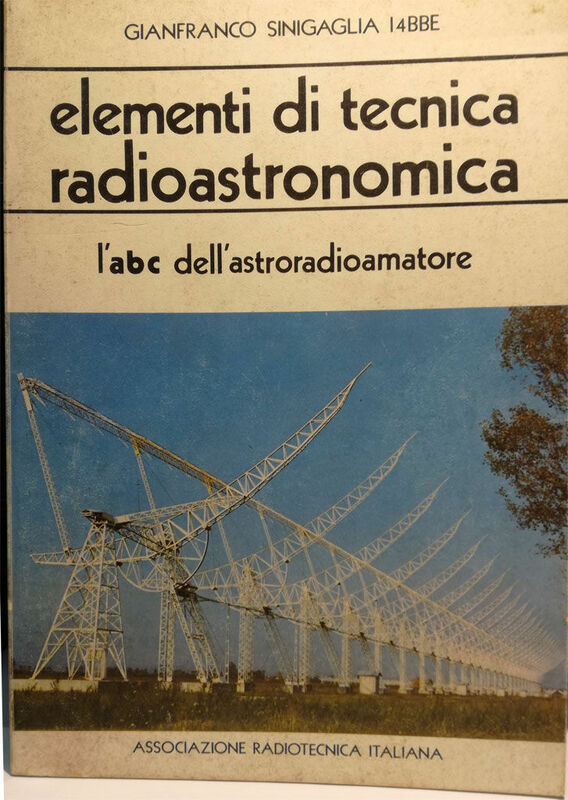 "Elementi di tecnica radioastronomica, an abc for the astro-radioamateur"
Pulsars are radio sources with quite an odd behaviour. They are characterized by regular pulses whose amplitude changes randomly. Whether these amplitude variations are to be blamed on the star itself or are due to the interstellar medium is still debated. The interstellar medium is not as empty as we might think, there are minimal traces of gas and dust, a notion learned from the study of the pulsars themselves. While the frequency of the pulsar is very regular the intensity of the signals of each individual pulse can vary so much that some pulsars disappear in a few moments while at other moments arrive very strong. The weakest pulsars (several dozen are known) can be received only by major telescopes, but some are sometimes so strong that they can be received by antennas with an effective area of about 100 m2. Radio amateurs who can build a fairly large array on a not too high frequency (e.g. 144MHz) can hope to "hear" them, even though we dislike the cliché that radio astronomers are the ones who "listen to the voice of the stars"! In fact the stars have no voice, they only emit coherent radiation and this applies to the pulsar too. In this case a simple manipulation of the signal allows to make the pulses audible turning them into signals similar to those of the WWV. As mentioned above, we need to have a good array e.g. with 8 Yagi antennas. 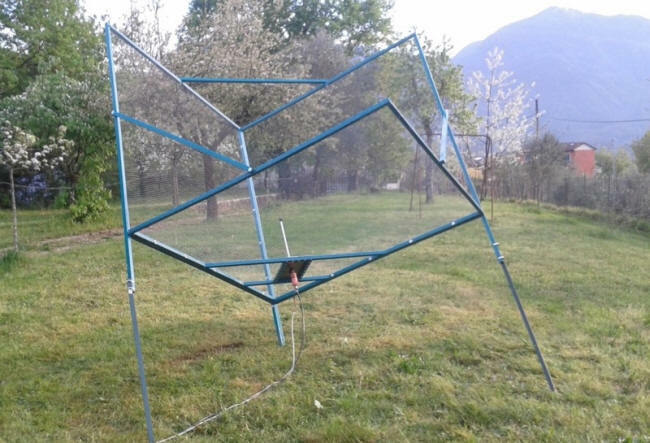 If each Yagi has 12dB of gain at 144 MHz, its effective area is about 8 m2. If we use 16 yagis by arranging an array stacking (H & V) of about 4 m you should get an effective area of about 100 m2. If the array consists of two 8 Yagi's stacked rows oriented in east - west direction the beam in this direction will be about 4° wide, corresponding to 15 minutes of pass time, while in north - south direction the beam width will instead be a dozen degrees. Since it is not practical to move an array of 16x11 elements yagis, we propose to keep our array fixed pointing to the zenith (90° elevation). We can move instead the declination beam by a few tens of degrees by varying the relative phase of the south row with respect to the north. This can be achieved by simply varying the length of the cable before the last hybrid coupler. 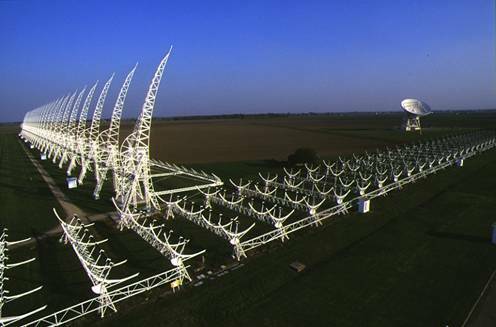 If the two connection cables of the array are the same length, the beam of the array will be aimed at the zenith, so we could receive sources between 36° and 48° (for 42° latitude N). Adding λ/3 in length to the north row of the cable it could receive instead sources between 46° and 58°. The receiver could be a good converter for 144 Mhz with 3dB or less NF and a flat pass band on all the 2 MHz bandwidth. The IF amplifier should also have a bandwidth of 2 MHz and it will be followed by the usual detector plus an amplifier - integrator set to the minimum time constant. Using an electrocardiogram recorder we could capture, with some luck, the strongest pulsars. If you would like to listen by ear the sound of pulsars to eventually record them on a tape recorder, you should add the circuit in the figure below, a simple amplitude modulator which modulates the integrator's output by a 1000 Hz signal. We should set the modulator voltage to the point where we can hear a very weak whistle. If the received signal's strength increases the whistle gets stronger, in case of a pulsar reception we could hear very short "beeps" WWV likewise. Of course we should avoid to try radio astronomical receptions during activity days or contest events on the 2 meters band! We could also try the reception on a local free UHF TV channel but here things get more difficult because pulsar signals are weaker on UHF and it's a problem to attain a proper effective area. Table of the most powerful radio sources visible in the northern emisphere as reported in the book. Source's coordinates are those in 1950. Sources flux were measured at 178 MHz and are in Flux Units F.U. (10-26 W * m-2 * Hz-1). 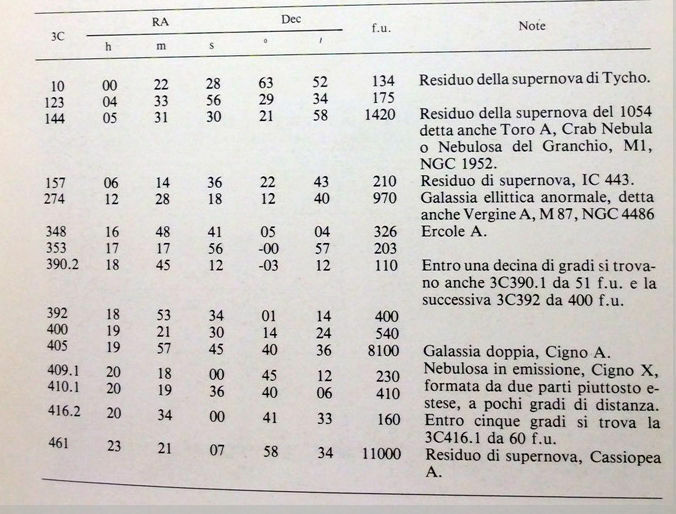 Table of the main known Pulsars in 1977, flux is measured at 400 MHz. We can see that the CP0329 and PSR0833 are the most powerful even if the latter at our latitudes can be visible only a few degrees above the horizon. Engineer Gianfranco Sinigaglia, was one of the designers of the Italian radio telescope "Northern Cross" of Medicina near Bologna. He came to radioastronomy from one of the biggest electronics firms in Italy: Magneti Marelli. He contributed to the construction of the prototype of the Northern Cross observatory, which initially observed the sky at 327 MHz. He was in charge for the electronics of the Northern Cross, designing most part of the necessary equipment for the emerging science that was then radio astronomy. One of his best known inventions was the field effect transistor analog correlator: a fundamental tool in radio astronomy. At the "Northern Cross", he designed and put into operation a multi-channel system for the precise control of signal phase from the multiple antenna array. 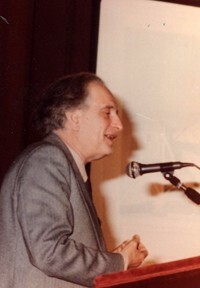 As professor of Radio Astronomy and Applied Electronics at the Department of Physics, University of Bologna, he was the founder and member of the Department of Astronomy. Probably more than 100 theses were discussed with him. A pioneer of radio astronomy observation, he was an enthusiastic researcher and popularizer even in different fields of science, such as the natural ones. There are publications and texts which describe the behavior of seeds and other biological material subjected to microwave electromagnetic fields. 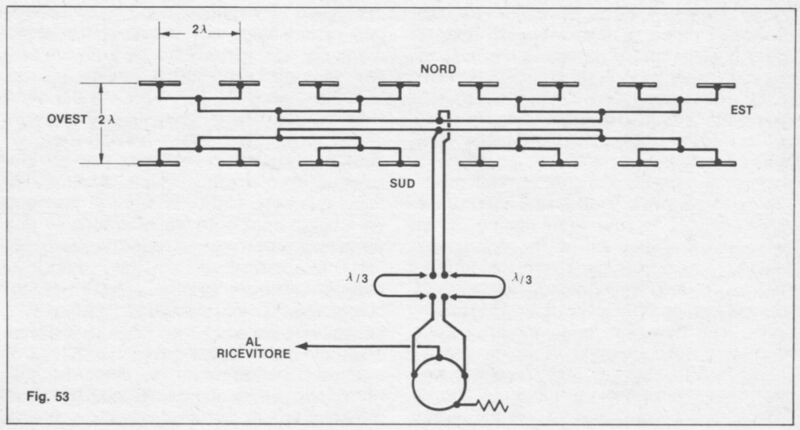 Gianfranco Sinigaglia was an unsurpassed communicator, with hundreds of technical publications in the field of radio communications, even for amateurs, so much so that the Bologna's chapter of the Italian Amateur Radio Association (A.R.I) bears his name. In 2009 the Minor Planet Center of the IAU has named the asteroid 200052 (2008 OO13 ) to Gianfranco Sinigaglia, I4BBE.